Printing documents seems to be old-fashioned in the modern era of digital communication. But occasionally printouts of documents are necessary. I for example use it for if I have to look on two or more documents to compare the contents which is pretty uncomfortable on an iPad because of the One-Window-Technique. Apple is known for simple and user-friendly solutions. In cooperation with Hewlett Packard the company developed the AirPrint technology. 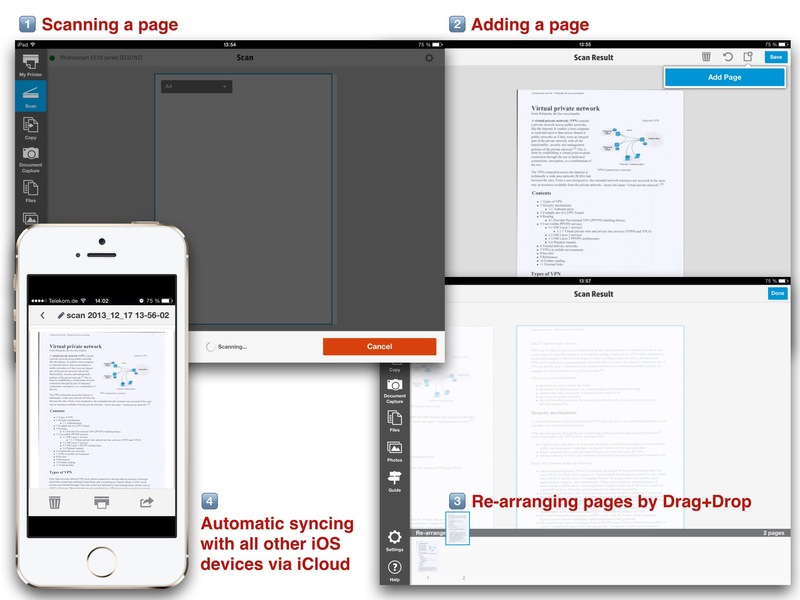 Presto by Collobos Software Inc. is an example for such a desktop application which allows printing from iOS devices to every printer connected to the same network. Bonjour is Apple’s implementation of Zero-configuration networking (Zeroconf), a group of technologies that includes service discovery, address assignment, and hostname resolution. Bonjour locates devices such as printers, other computers, and the services that those devices offer on a local network using multicast Domain Name System (mDNS) service records. Bonjour comes built-in with Apple’s OS X and iOS operating systems. Bonjour can also be installed onto computers running Microsoft Windows. After connecting the printer to the WiFi network it appears in the print menu of every printing-capable app. No installation of drivers, no cables, no additional software which usually comes from an installation CD and is nothing more than ad of the manufacturer. 1 HP wireless direct allows you to connect your iPad directly to your printer wirelessly, without a wireless router. The printer must be equipped with HP wireless direct, and HP wireless direct must be turned on to connect to any iOS device. 2 When connecting to the printer over a WiFi network, you are connecting to the printer using a wireless router. The printer might be wirelessly to the router or with an Ethernet cable. A connection is established after entering the WiFi password. 1 Take a photo and automatically transform it into a PDF. 2 Scan pages placed on the device by using the control buttons on the printer’s display or controls displayed in the app. 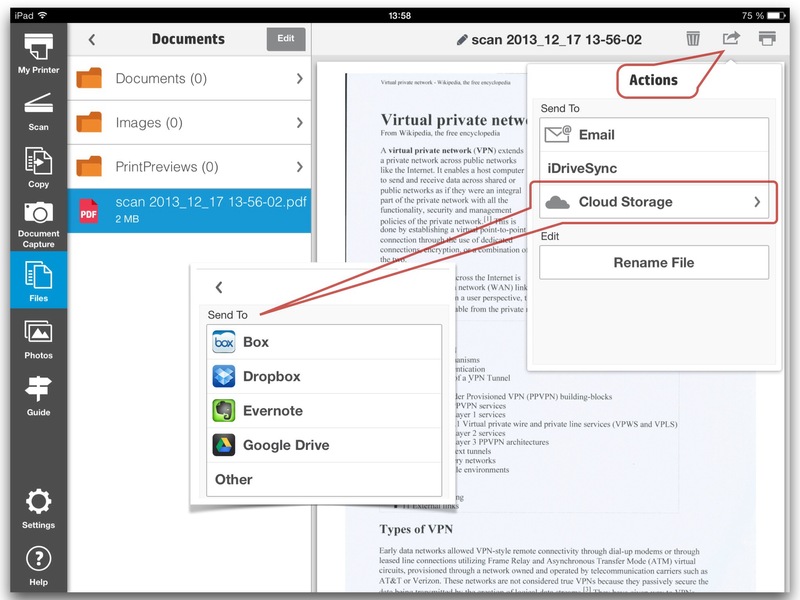 Save scanned documents in the app specific folder on your iOS device or in the cloud (Google Drive, Dropbox, Box, Evernote, Photostream, or many other cloud storages like iDriveSync via WebDAV). 3 Copy documents using the control buttons on the printer’s display or the controls shown in the app. 4 Show printer details like settings, comnections, supply levels, and print reports like network configuration, wireless test report, or print quality report. 5 Automatic upload of new documents to iCloud and syncing documents across all your iOS devices. 6 As already mentioned AiO Remote can be connected to different cloud storages. So it’s also possible to download documents from there. They can be printed, saved locally, sent by mail, or transferred to other cloud storages. Unfortunately Apple’s iWork file formats are not supported. 7 Optional usage of the HP ePrint Service which allows to send print jobs to an E-Mail address registered on the HP ePrint website. If the registration process is finished your printer gets an E-Mail address from HP. Print jobs can be sent to this address and the printout is done if the printer is turned on. So you can print documents from anywhere by sending an E-Mail to your printers E-Mail address. All these print jobs can be managed using the HP ePrint app or the HP ePrint website. The HP ePrint service can also be used to print documents on nearby HP ePrint centers e.g. hotels. Nearby centers are shown within the app if Apple’s location services are turned on. I summarized some features of the configuration by taking screenshots. When people are evaluating mobile printing solutions, one of the options is to buy a new printer. If you already use a non-AirPrint capable printer it cannot receive print jobs from your iOS device. Presto (former name FingerPrint) by Collobos Software Inc. addresses this problem. 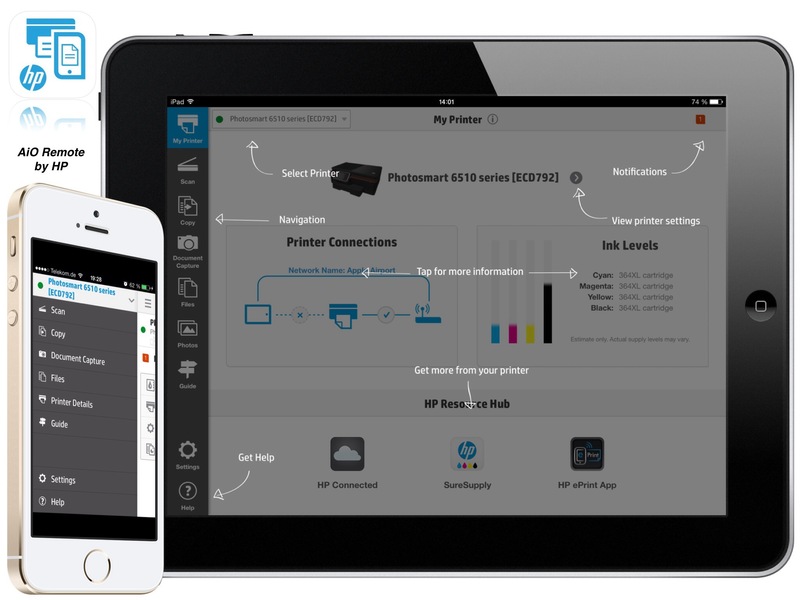 The application finds your classical printers automatically and makes them available to your iOS devices if both, printer and iPhone or iPad, are in the same WiFi network. Consider a network with an attached printer and an iOS-Device in the same network. Install Presto on a Mac or a PC connected to this network. For your iOS-Device no further action is needed that means no special app has to be installed. Presto finds all network attached printers automatically and they can be selected on the iOS-Device with the SELECT PRINTER dialog within every app which supports printing. See this video for a short description of Presto by Collobos. AiO Remote is a continuously updated app from a reliable developer with outstanding features. UI and UX are perfect and the iCloud integration lets you take photos of documents with your iPhone which already arrived when you come home and use your iPad for further actions.